STRI has the capability to perform dielectric type tests on Gas Insulated Switchgear (GIS) such as breakers, disconnectors, busbars, etc, up to 1100 kV system voltage. These tests include Test Duty 1, 2 & 3 for making and breaking of bus-charging currents on disconnectors according to IEC 62271-102. Test Duty 2 can be performed with currents up to 2 A. For efficient testing the test bay can be mounted on a flexible mounting frame. This allows for even a large test bay to be moved while fully assembled. 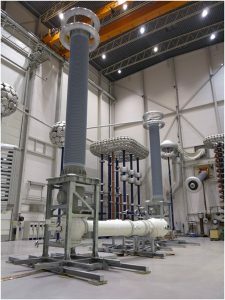 Three phase testing of GIS up to 420 kV system voltage can be performed.